Bobby Ray Timmons was born on August 23rd, 1951 in Arcadia Louisiana to the late great T.H Timmons and Eariness Cobb. He was the last born of this union. His Brother Billy Timmins precedes him in death. He leaves behind brother John Lawrence Timmons, sister Emily Kabara (Timmons). Bobby moved to San Francisco California at an early age with his mother where he attended Woodrow High School. Shortly after he found the love for roofing which he did for over 30 years. In the Summers of 1973, he married Dolores Ann Norman and had four children. 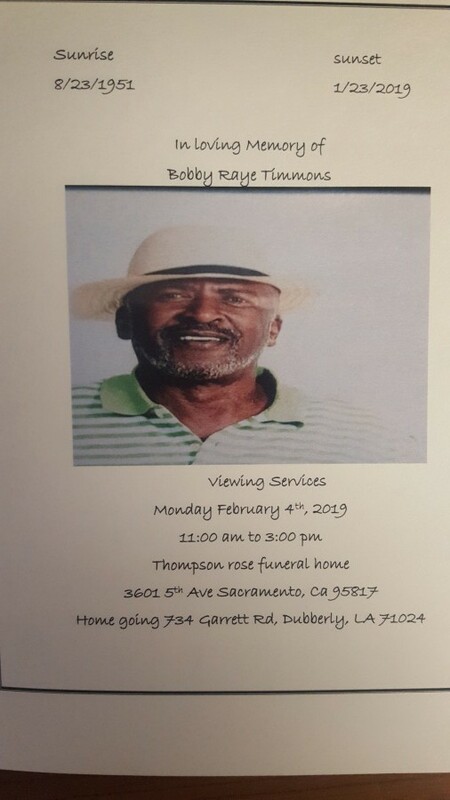 Bobby leaves to cherish his memory: three daughters, Wisteria Timmons, Shameka Timmons Gill(humayoun), Chanel Timmons-Pennington (Tommie) Son little Bobby Timmons (Kizzy). All of Sacramento California seven grandkids, Jaquan and Jannet Lawrence, Loretta and Daylisha Asberry, Chalys and Jamon Pennigton and Delia Timmons. Two great-grandkids Desaree and Jordyn Lawrence. A host of nieces and nephews, aunts, uncles, cousins and Friends.